Helmut Kohl, in hand with Edward Shevardnadze, Michael Gorbachev, and George H.W. Bush, convinced Europe to rise to the occasion and believe that history can progress, that unity and national sovereignty can go hand-in-hand, and that conflict is not inevitable when Germany is united. Today, perhaps more than ever before, we look to Germany for leadership, because its national unity required a leap of trust. We placed our trust in Helmut Kohl in the belief that Germany will become the custodian of a vision of European unity between nations and peoples, states and societies. I remember in 1996 joining a meeting between President Eduard Shevardnadze and Chancellor Helmut Kohl, in Bonn. Today all meetings are held in Berlin. That is the legacy of Helmut Kohl, for Germany and for Europe. The Chancellor of German reunification asked us to believe that a Europe “Whole and Free,” was possible, and Shevardnadze rallied a critical mass of supporters for this vision. Europe was convinced, not without resistance thatthe union of Germany and Europe were two indivisible dimensions of the same coin,that enlargement and national unity went hand-in-hand. Europe has come a long way. 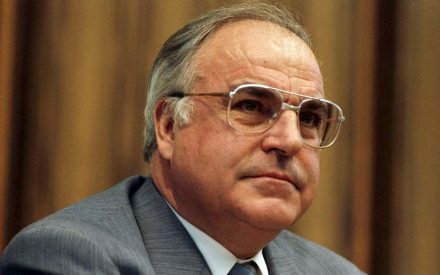 Through enlargement, transnational policies, and interdependence we are triumphing over war, oppression, and authoritarianism.For all that we owe much to the vision of Helmut Kohl, who saw no contradiction between patriotism and Europeanism, who saw in the nation a bond of pride that must be tamed by a community of values and interests. Georgia strives for its place in that community, and claims historic entitlement, in a bond signed between friends, Shev and Helmut, over a generation ago. We have been and remain committed to the notion of shared freedoms, foundational values, and rights, common markets and norms, which bind our nations in a civilization of mutual respect, the rule of law, joint prosperity, and the right of self-determination. We remain committed to the ambition of Europe that acculturates and tames the primordial instinct of the nation. And for this commitment, we must thank the generation of leaders that reached the brink of another era, looked over the chaos of the unknown, placed their trust in progress, and kept walking. Among these leaders, Helmut Kohl was first among equals.